First up was Will Buck riding Shannondale Prophet (Ivan) in the Prelim and the Novice. Ivan’s most favourite thing is Cross Country so he finds dressage quite tedious but with time, patience and training by both Will and Becky he is really starting to show a talent for the dressage arena. Apart from a mistake in the right canter in the first test Will rode two very nice tests. 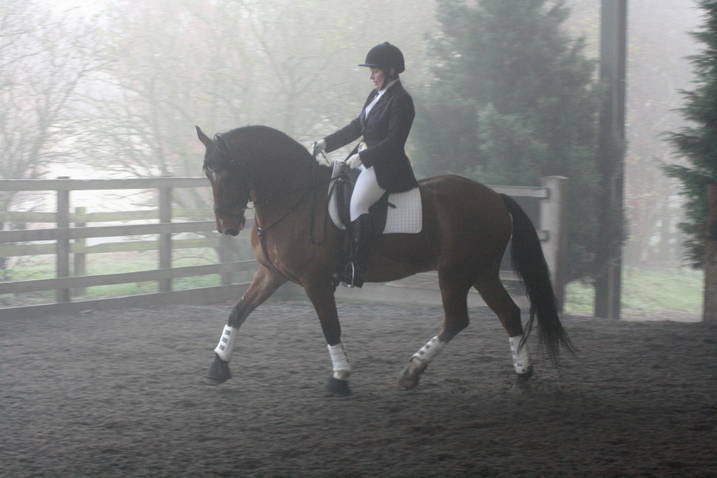 We were slightly disappointed with the marking from the judge, but thats dressage! 2 horses down 2 to go – Becky was next in the Elementary on Josie’s Don Angelo or Donald as we call him! He was rather fresh on the wagon as it was the first time we had him out but he soon settled once Becky was on board. They scored an amazing 77.58% with, as you can imagine a lovely test! It was then Josies turn to ride Donald after proving what a good boy he was, so in the 2nd Elementary Josie also rode a great test and scored 72.05% – hopefully this is a sign of things to come as Josie and Donald make a wonderful combination! A great day was had by all – espescially by Ike!